In 2019, R-M, the productivity paint brand of BASF, is celebrating a hundred years in business and will be presenting its success story through a range of activities. The centenary year kicked off at the North American International Auto Show (NAIAS) in Detroit, where R-M presented a special video showing the most important milestones through which the brand has shaped and developed the automotive refinish industry since 1919 – all thanks to the pioneering spirit of its founders. Throughout the years since the two friends Fred Rinshed and Herbert Mason established the R-M firm in 1919 in Detroit – the very heart of the automotive industry – this premium brand has gone global and has been shaping the automotive refinish industry thanks to major innovations and a pioneering spirit. R-M is now a BASF brand and part of its philosophy has always been to make the economic success of its customers the focus of its efforts. By using products, services and processes that are continuously improved and made even more user-friendly, vehicle painters throughout the world are making the best choice to ensure their long-term productivity and success in the future. R-M invites its customers to look back at the milestones of the company’s history. The motto is: “Being successful means being innovative.” Thanks to its innovations, the brand has always made a significant contribution to the development of the automotive sector. Starting the celebration in Detroit, the birthplace of R-M, it continues at the international R-M Refinish Competence Center in Clermont-de-l’Oise (France), where R-M built its first European plant 50 years ago, via an exhibition showing how R-M’s products and color expertise have developed and through historical exhibits relating to the brand’s history. In addition, digital development in paint training and the promotion of young talent via the R-M Best Painter Contest will be also celebrated this year. Worldwide, the R-M brand would like to share its experiences with its customers – and its success stories. 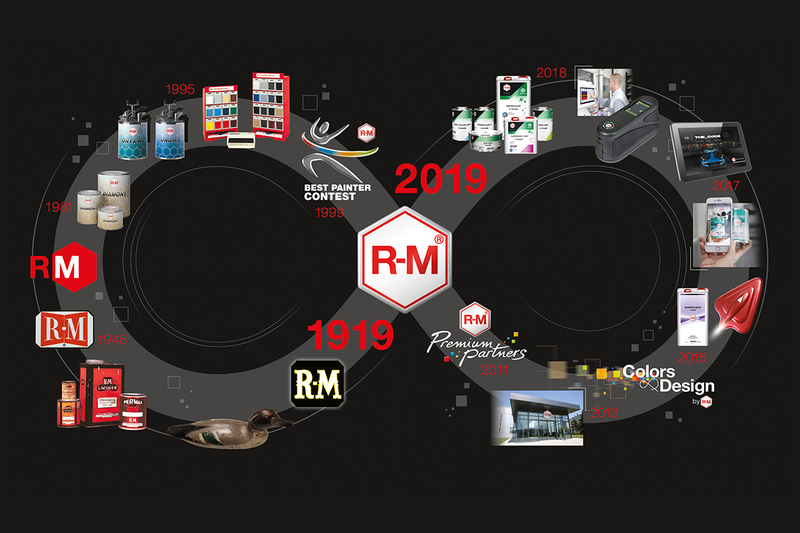 The brand will be celebrating 2019 on its website basfrefinish.com and on social media with the hashtag #rmpaint100yo throughout the year. Under the R-M brand, BASF markets a comprehensive range of paint systems for vehicle refinishing. By using these systems all legal solvent-reduction requirements can be complied with, anywhere in the world, and with regard to appearance and resistance, the products meet the same quality standards as solvent-borne paints. In this area, the company offers a wide variety of services to support its customers. R-M Automotive Refinish Paints is approved by most of the leading car manufacturers for aftermarket repair and chosen by the world’s most prestigious car companies for its color expertise.